The free holiday shuttle picked up and ropped riders off at the train depot in downtown Truckee. TRUCKEE, Calif. — The numbers are in, and they do not lie — Truckee’s first-ever week-long holiday shuttle service was popular, but only in certain areas, during certain times of the week. 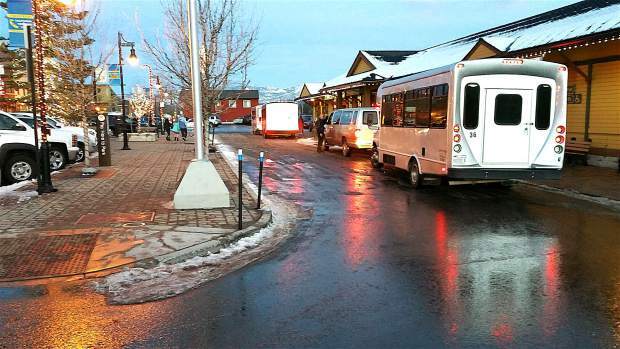 “It is a little disheartening to see low or no ridership during the week in some neighborhoods,” said Truckee Administrative Analyst Kelly Beede in an email. According to data from the town, the shuttle service to Prosser and Donner Lake had no riders at all on Dec. 26. One of the reasons for the increase in ridership, Beede said, was the increase in service hours. In 2014, the shuttle only operated from midnight to 3 a.m. on New Year’s Eve. In 2015, it operated from 7 p.m. to 3 a.m. the same day, and this year it operated resort routes from 6 p.m. to 3 a.m. and neighborhood routes from noon to 3 a.m. The town announced in October that it was considering providing a free shuttle service for the entire week between Christmas Day and New Year’s, in a effort to reduce traffic congestion, parking shortages and driving under the influence. The idea was inspired in part by the success of a similar free shuttle offered during the weekly Truckee Thursdays event to and from downtown. In November, the council approved a $56,000 maximum contract with the service provider, and local partners also contributed $26,410 for the service. This week, Beede said the shuttle’s total cost amounted to nearly $60,000, with the partners providing 44 percent of that — $26,410. Use of the week-long holiday shuttle service varied largely depending on the day, according to the town. Across the board, all routes served the greatest number of riders on New Year’s Eve. But as for the routes themselves, more than 34 percent of those who used the shuttle used the Northstar line, and more than 20 percent used the Tahoe Donner line. Squaw Valley was the third most common route, and it was used by 16 percent of the shuttle’s passengers. Beede also noted that the shuttle was most frequently used from 6-11 p.m., and said this information would be helpful in the upcoming development of Truckee’s long-range transit plan. Amanda Rhoades is a news, environment and business reporter for the Sierra Sun. She can be reached at arhoades@sierrasun.com, 530-550-2653 or @akrhoades.